If you’re worried about intelligent robots taking over the planet, don’t be. Self-driving cars are here to take them down. Although, you might have to start preparing for self-driving cars to wipe out humanity instead. 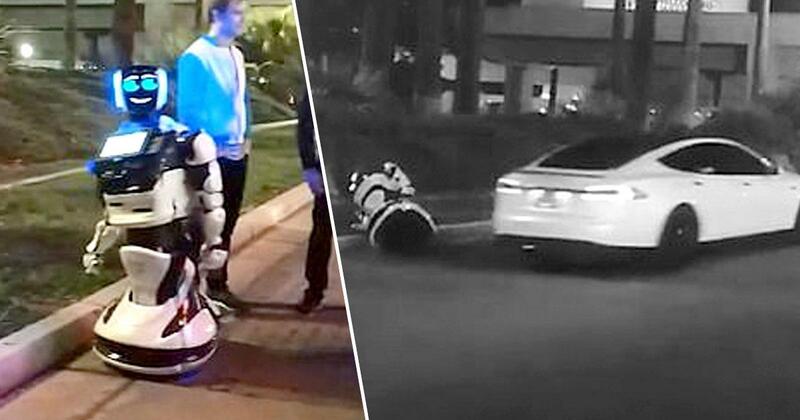 In what’s possibly the most futuristic story ever, a driverless Tesla knocked down an autonomous robot after the computerised victim journeyed into the road. The robot was a v4 model from Promobot; part of a collection of ‘autonomous robot[s] designed for business purposes’, which are rentable for $2,000 a day. They perform the functions of administrators, promoters, hostesses, Museum guides, consultants, concierges, and many others. After Sunday’s collision, the firm revealed one of their creations had been ‘killed’ as the robots made their way to the booth at around 7pm, when the bot strayed out of line and into the parking lot roadway where it was struck by a Tesla Model S.
The car was operating in autonomous mode, though according to the there was a passenger on board. The car continued driving for another 50 metres after the accident before finally coming to a stop. Now, I’m not saying for certain the robot had become self aware and was trying to escape from its life as a smiling servant, but I’m just going to leave it there for your consideration. While I’m quite confident in my theory, other people believe the incident was actually an over-the-top PR stunt from the firm – though it’s unlikely Elon Musk knew anything about it. The crash doesn’t exactly do much to promote the safety of Tesla’s driverless cars. Promobot explained, as the two futuristic creations collided the robot was tipped on to its side, causing ‘serious damage’ which is likely irreparable. 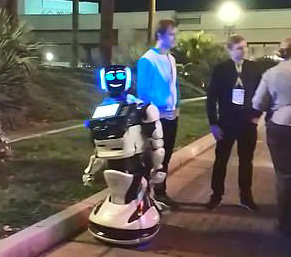 The injured bot was unable to be displayed at CES as parts of its body, head, arm mechanisms, and movement platform were destroyed. Of course we are vexed. We brought this robot here from Philadelphia to participate at CES. Now it neither cannot participate in the event or be recovered. I thought the flivver would come round, but it bumped straightly into the it! [sic] I am so sorry, the robot looks cute. And my sincere apologies to the engineers.